In 1901, George Ward, a lynching victim, was attacked, murdered, and dismembered by a mob of white men, women, and children. As his lifeless body burned in a fire, enterprising white youth cut off his toes and, later, his fingers and sold them as souvenirs. In Embodying Black Experience, Harvey Young masterfully blends biography, archival history, performance theory, and phenomenology to relay the experiences of black men and women who, like Ward, were profoundly affected by the spectacular intrusion of racial violence within their lives. Looking back over the past two hundred years---from the exhibition of boxer Tom Molineaux and Saartjie Baartman (the "Hottentot Venus") in 1810 to twenty-first century experiences of racial profiling and incarceration---Young chronicles a set of black experiences, or what he calls, "phenomenal blackness," that developed not only from the experience of abuse but also from a variety of performances of resistance that were devised to respond to the highly predictable and anticipated arrival of racial violence within a person's lifetime. Embodying Black Experience pinpoints selected artistic and athletic performances---photography, boxing, theater/performance art, and museum display---as portals through which to gain access to the lived experiences of a variety of individuals. The photographs of Joseph Zealy, Richard Roberts, and Walker Evans; the boxing performances of Jack Johnson, Joe Louis, and Muhammad Ali; the plays of Suzan-Lori Parks, Robbie McCauley, and Dael Orlandersmith; and the tragic performances of Bootjack McDaniels and James Cameron offer insight into the lives of black folk across two centuries and the ways that black artists, performers, and athletes challenged the racist (and racializing) assumptions of the societies in which they lived. "Focused on the frequent "performance of stillness" employed to challenge terrorizing effects of racial violence, compelling case studies reveal similarities between embodied black experiences of the past and the present. 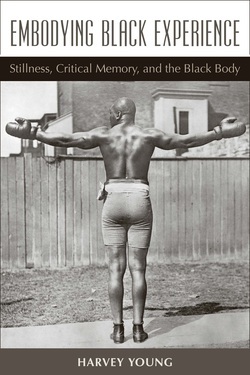 And the author's stunning analyses of disparate sources from 1810 to the present align stillness within the daguerreotypes and photographs of Joseph T. Zealy, Richard Roberts, and Walker Evans to the resistant motions of boxers Muhammad Ali, Tom Molineaux, Jack Johnson, and Joe Louis; the theatrical enactments by Robbie McCauley, Dael Orlandersmith, and Suzan-Lori Parks; and the souvenir remains of lynchings. Young's writing is evocative and precise, and he draws on relevant cultural and literary theory (Agamben on social witnessing, Fanon and Monhanram on postcoloniality)." "Each of the chapters offers a complete narrative within, as well as connecting beautifully from one chapter to the next ... While Young addresses some topics which have been scrutinized extensively in African American studies, he offers angles, suggestions and ways of looking that have not been explored heretofore…Young's close readings of each subject are exemplary and detailed, but also accessible and clear, making this book a sound example of performance-studies scholarship in the field today." "Near the end of Embodying Black Experience, Young encapsulates his argument in a single material object: the lynching souvenir, a piece of a dead (or soon to be killed) body, such as a toe or a strip of flesh, which was cut off as a keepsake of the event...Young movingly charts how the meanings of these effects have changed over time. These body parts originally emblematized the carnival atmosphere of the lynching event; because of the efforts of chroniclers and historians, however, they are now remainders/reminders of an act of complicit communal violence upon an individual. As historical and cultural perspectives shift, what once was the “idea of the black body” becomes a black body."